Tata Motors has launched a mildly refreshed Sumo MPV dubbed the ‘Sumo Gold’. It is priced between Rs. 5.54 lakh and 6.86 lakh, ex-showroom, Delhi. The Sumo Gold is available in 4 variants – CX, LX, EX and GX with 7 or 9 seat configurations on all variants. It comes with a warranty of 3 years or 1, 00,000 km, whichever is earlier. The new Sumo has been mildly tweaked both on the exterior as well as the interior. These changes, together with an improved BS-IV engine and better mileage; make the Sumo Gold, more appealing for buyers looking for a spacious entry-level utility vehicle in the Indian market. The Sumo Gold gets minor tweaks in the front with a redesigned grille that has the word ‘SUMO’ embossed on a chrome strip. The refreshed headlamps; redesigned front bumper, new round fog lamps and body decals all try to hide the old-school, boxy design of the Sumo Gold. The outside rear view mirrors of the Sumo Gold look similar to that of the Tata Vista hatchback and the spare wheel is placed below the cabin. The Sumo Gold gets new switches for HVAC and power windows and a four spoke, leather wrapped, steering wheel. The Sumo boasts of large cabin space with plenty of headroom, legroom and adequate shoulder room for front and middle row passengers. However, the rear occupants may not get much head room and leg room in the 9 seater configuration, though shoulder room is adequate. The major update in the facelift version is the new BS-IV engine. The Sumo Gold is now powered by a 3-litre, CR4 (Common Rail) BS-IV compliant engine that makes 83.8 bhp of power and 250 Nm of torque Tata also offers the Sumo Gold in a BS-III version which is powered by a 3-litre DI Turbo engine that makes 69 bhp (70 PS) of power and 225 Nm of torque. Both the engines are mated to a 5-speed transmission. The ARAI-certified mileage for the CR4 engine is 14.7 kmpl while that of the DI Turbo engine is 14.3 kmpl. The company states that it has improved the transmission which will now facilitate smoother shifting via a short throw gear lever. The Sumo Gold gets softened suspension for better ride quality over rough roads. 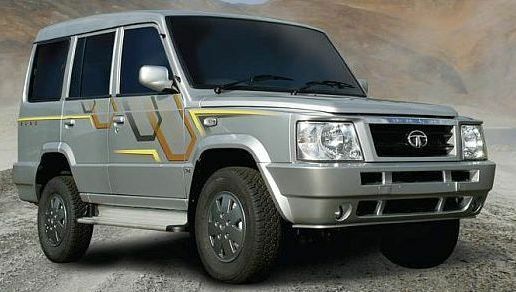 The Sumo Gold will compete with the facelifted Bolero launched recently at a price of Rs.6.19 lakh. The Tata Sumo Gold offers less mileage (14.7 kmpl) when compared to its chief rival, the Mahindra Bolero which has claimed mileage of 15.96 kmpl. However, the Sumo Gold has an edge over the Bolero when it comes to turning radius (4.9 m), ground clearance (190 mm), interior space and cheaper price. The Bolero has also been the No.1 SUV in the past five years and holds a market share of 35% in the entry SUV segment while the Sumo family (Victa, Spacio and Grande) have 15% market share. Another worthy competitor for the Sumo Gold will be the upcoming Chevrolet Tavera BS-IV version which is currently available only as BS-III version. « Best diesel premium small cars under Rs.8 lakh in India!